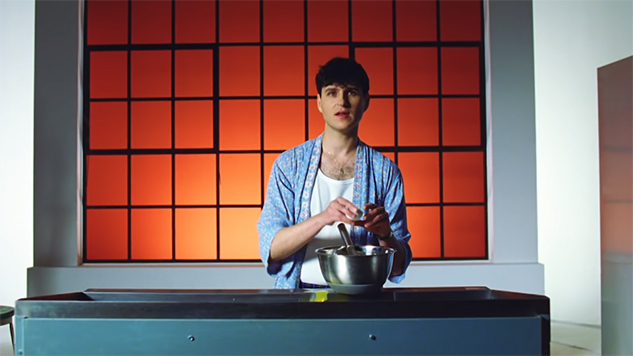 Vampire Weekend Cook up a Video for "Harmony Hall"
Vampire Weekend have released a music video for “Harmony Hall,” the first from their forthcoming album, Father of the Bride. The video proves that the band have stayed hip to modern indie-rock trends through their extended absence, as it features tucked-in, oversized t-shirts, breakfast foods and an appearance from Jonah Hill. Ezra Koenig and company were recently spotted filming what would appear to be a different video in New York City, where they were also accompanied by both Hill and food. Watch the video for “Harmony Hall” (dir. Emmett Malloy) below, and listen to Vampire Weekend’s 2007 visit to Daytrotter Studios, included further down.